"You did not choose me, but I chose you and appointed you so that you might go and bear fruit—fruit that will last—and so that whatever you ask in my name the Father will give you" (John 15:16). What is the first thing that comes to mind when you hear the word "options"? My first thought was stock options and the desire to have a few of them to exercise so I can quit my day job, focus on ministry and writing, and perhaps replace an aging appliance or two. But there are more common options like where to eat dinner, what color to dye our hair, or which outfit to wear to work tomorrow. Life is all about options and our free will to make choices. The problem is, the options we choose can have disastrous results and cause a lot of hurt to the people we love and even to ourselves. When we opt to drink excessively then get behind the wheel of a car, we put ourselves and others at risk of bodily injury or death. When we choose to use a credit card to purchase something we cannot afford, rather than defer our spending until we have saved enough cash, we risk financial reversal, bankruptcy, or foreclosure, or at the very least, unbearable and unnecessary stress. Not all options are bad, however. As children of God, we can choose NOT to sin, NOT to worry, and NOT to fear. We can choose to follow His Word, walk in His ways, and be strengthened by His joy as we spend time with God in prayer and stand on the promises of Scripture. Of all the options we will face in this life, none is more important than choosing to receive Christ as Savior. In fact, it is only by repenting of our sins, receiving Him as Savior, and living surrendered to His lordship that we will find lasting fulfillment in this life, and enjoy His abiding presence eternally in heaven. Exercising stock options will never accomplish that. Choosing the finest things money can buy -- even if we can afford them -- will not bring us peace. Only Christ can do that for us. Are you ready to exercise your option to become God's child by receiving Christ's free gift of salvation? By opting in, you will inherit eternal riches, live in the home He is preparing for you in heaven, and enjoy the peace that surpasses all understanding while you remain on this earth. Each of us is only guaranteed this moment. Don't let the opportunity pass you by -- Opt in now! Dear Jesus, my life has been all about making wrong choices, and I have made such a mess of things! Help me to understand that my choice to sin deserves the death penalty, but that You chose to die in my place on the cross so I could live with You in heaven for all eternity. Please forgive my sins and come live in my heart as Savior. Today I choose You, Jesus. April 15 is as American as a day can be. It is the day we pay our taxes for the privilege of living and doing business in a country that many consider the greatest nation on earth. This year it also happened to be Patriots Day and the day of the Boston Marathon, an event marred by an act of terrorism when two bombs were detonated near the finish line, killing three and injuring scores of runners and onlookers who had gathered for this annual event. It was the beginning of a tragic week and was a day that once more showed us how vulnerable we are and how quickly our lives can be forever changed. On the heels of that devastating act of terrorism, which left the city of Boston and our entire nation shaken and fearful, the small town of West, Texas, was nearly destroyed by an explosion at a fertilizer plant. Many people died or were injured, homes and businesses were destroyed, and many who survived were evacuated from their homes for fear of additional explosions or a cloud of toxic fumes. This peaceful community took on the appearance of a war zone. Life will never be the same for those who live there. These events, along with the attempted delivery of letters containing the highly toxic poison, Ricin, to our President and a Mississippi politician, have left many of us reeling and wondering when something like this might happen a little closer to home. Are we safe? Are terrorist attacks like the one in Boston this week and the 9/11 attacks on our country over a decade ago signs of eminent danger for America? Should we as individuals be afraid of what could happen? Scripture (Matthew 24, Mark 13) explains that catastrophic events such as natural disasters, wars, and rumors of wars are signs of the end times and assures us of Christ's return for those who have become His children by accepting Him as Savior. So, what have we to fear? Those of us who belong to Christ have nothing to fear because there is nothing that can separate us from the love of Christ (Romans 8:38-39). If we trust in God and believe the promises of His Word we need not fear what man can do to us (Psalm 56:10-12). Even if we are injured, ill, or lose our lives we can be assured that we will live in the presence of God for all eternity. Are you afraid? If so, why? Could it be that you have not yet taken care of the one thing that matters most by placing your life in the hands of the only One who can truly save you? Evil will always be present in this world, but Christ has overcome the world. When you receive His salvation by placing your faith in Jesus Christ, then no matter what happens you can know with certainty that you will spend eternity with Him in heaven. Recently I decided to step out of my comfort zone and try wearing contact lenses instead of glasses. My eye doctor didn't share my enthusiasm for this experiment because as a fifty-plus-age bifocal wearer she knew this would be a huge stretch for me. Still determined, I walked out of her office last week with new contacts in my eyes and a new lease on life. What I didn't count on, however, was living 3-D in a two-dimensional world! Have you ever looked at a book or flash card that had a 3-D picture on it? When you stare at the picture, the objects seem to lift off the page. Or think of what it is like to sit in a movie theater watching a 3-D movie without the 3-D glasses to bring all the elements into focus. That is what my vision has been like this week as I have tried to see my computer monitor and read without the correction of reading glasses. Although I haven't been made nauseous by the appearance of floating icons and blurry text messages, I have been quite irritated that I cannot even work at my computer without glasses of some sort on my face! Don't get me wrong -- I LOVE 3-D, but not in my little two-dimensional world. Am I ready to abandon the contacts and go back to glasses? Not a chance! I don't like cleaning my glasses or having to wipe them off if a little sweat or rain gets on them. There has to be a solution for someone like me, so when I find it you'll be the first to know. It has been my pleasure to serve and get to know Mrs. Heather Olford for the past few years and to glean godly wisdom from her as she has served her Lord. Most recently I have had the privilege of sharing her joy as she published the story of her life, Together with God. As one of the first to read her book, I have gained new insights into the heart and soul of this delightful woman of God. 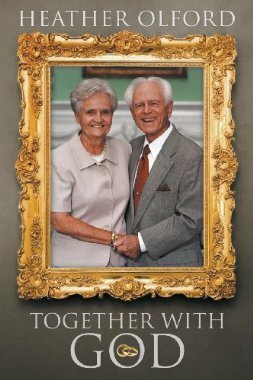 Together with God is an engaging account of Mrs. Olford's spiritual journey, lifelong ministry, and marriage to Dr. Stephen Olford. 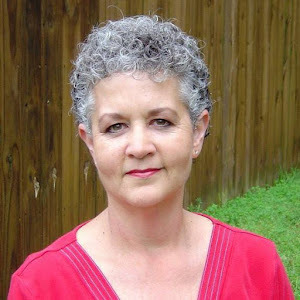 Beginning with her early years in Lurgan, Ireland, she shares memories of her childhood, her encounter with God as a young woman, her engagement to Dr. Olford, and her growing passion for ministry as a surrendered servant of God. Although her book will appeal to both men and women from any walk of life, it is a must-read for those who desire to serve God and for women who desire to be the wives and helpmates God has designed them to be. Together with God is available from www.innovopublishing.com, www.amazon.com, and other online retailers. For more information or to order a copy, please visit the publisher's website, http://www.innovopublishing.com. The weather was gorgeous here this weekend. Home improvement stores and garden centers were overrun with people sick of winter and ready to spend time in the great outdoors. While everyone else was out shopping for landscape items or cuddled up with the Final Four tournament, I was out grocery shopping for the family. What was supposed to have been a peaceful and productive Saturday turned out to be anything but that. My best laid plans were sabotaged before my eyes ever saw the light of day. Family squabbles and schedule changes turned a stressful morning into a day-long marathon of misery and there was nothing I could do except pray myself through it and ask others to do the same. Some days are just like that, aren't they? As I sauntered into Wal-Mart, my third stop on the grocery store tour, I decided I at least deserved to "look" at the plants in the garden center, even if I didn't have time to plant any. I resisted the urge to buy Knockout roses, even though my landscaping plans include replacing some old azaleas in front of the garage. 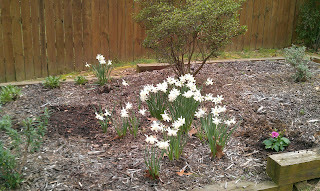 As quickly as I placed them in my basket I removed the rose bushes, proud of my ability to resist the impulse to purchase them. 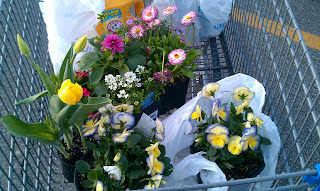 But then my eyes fell on a variety of violet (or pansy -- I'm not really sure which) that I just had to have. 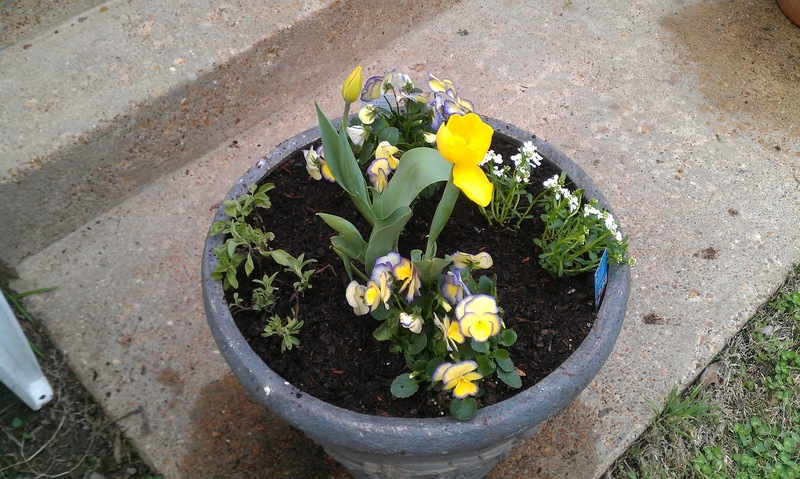 The delicate purple and yellow blossoms were irresistible and would look so nice surrounding yellow tulips in my planter. 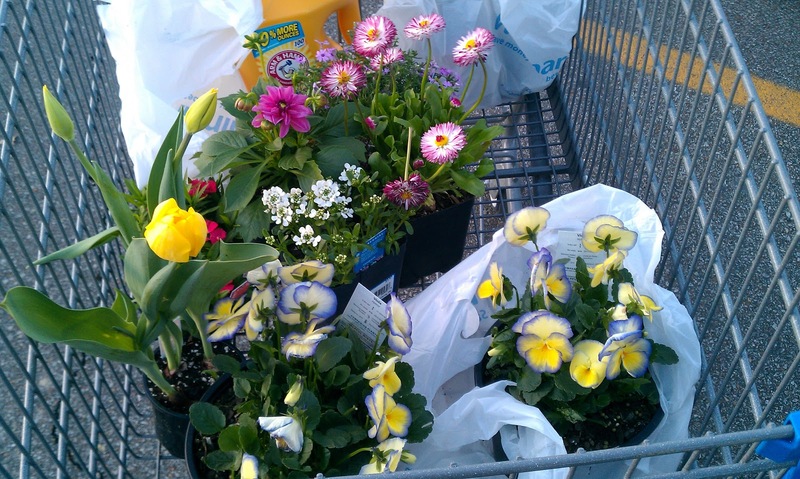 With each perennial that landed in my basket, the stress seemed to melt away and my spirit lifted. With the sun setting I knew there would be no time for planting, but at least I had something pleasant to look forward to after church the next day! 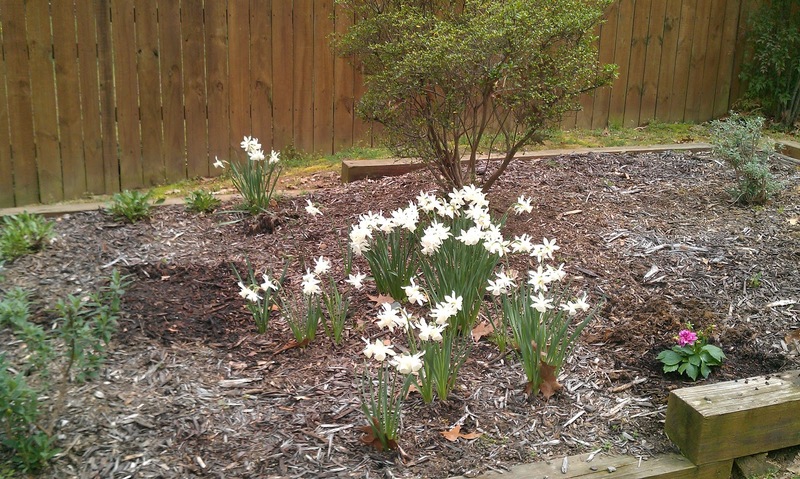 Gardening has always been therapeutic for me. At the end of a stressful day at work or a heated argument with a family member, I know that I can walk through my backyard, survey the beauty, and reconnect with the God who walks with me not only in my peaceful garden but also through every dark valley and stressful circumstance of life. Now that the flowers I purchased have been planted and sunflower and coneflower seeds have been sown, it is time to watch and wait for new life to begin, not only in my garden but in my heart. If someone were to ask you what your passion is, what would your answer be? Coffee? Chocolate? Your family? Sports? Odds are your answer would be related to a particular person or thing that you love, that person or thing that brings you happiness like nothing else does. "But I'm not really passionate about anything," you might say. We are each passionate about something at some point in our lives and if we're lucky, our purpose in life is driven by that passion. Those who know me might think that my passion is coffee. Certainly it is high on my list, but it doesn't come close to the mark. Some days I don't have time to indulge my passion the way I would like, but that doesn't make it any less my passion. Have you figured out what my passion is? My passion is encouraging others with the truth of God's Word. It is the underlying purpose for my ministry and the one thing that makes every pain and heartache I have suffered worthwhile. I am convinced that God doesn't waste anything in our lives. We may waste what does or does not happen, but God never does. There is a lesson to be learned and shared even in our greatest trials and joy to be shared in our greatest triumphs. If you aren't certain what your passion is or should be, ask God to give you passion for something that will bring honor to Him. After all, He knows about passion -- He is passionate about you!